Eschew the tourist crowds and head to Roebuck Bay and Broome Bird Observatory. Next up on the itinerary: get a new perspective on things with Boat Tours & Water Sports, view the masterpieces at The Courthouse Collection, browse the exhibits of Short St Gallery, and enjoy the sand and surf at Reddell Beach. To see photos, maps, where to stay, and tourist information, you can read our Broome holiday website . Melbourne to Broome is an approximately 6-hour flight. You can also drive; or do a combination of train and bus. The time zone changes from Australian Eastern Standard Time (Victoria) to Australian Western Standard Time, which is usually a -2 hour difference. When traveling from Melbourne in May, plan for much hotter days and somewhat warmer nights in Broome: temperatures range from 38°C by day to 22°C at night. Wrap up your sightseeing on the 22nd (Wed) early enough to travel to Dampier Peninsula. Start off your visit on the 23rd (Thu): explore the striking landscape at Cape Leveque. 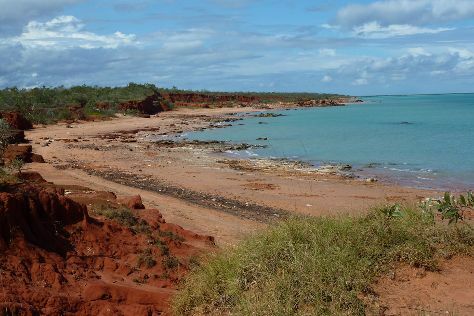 For ratings, where to stay, other places to visit, and tourist information, you can read our Dampier Peninsula trip itinerary builder site . Traveling by car from Broome to Dampier Peninsula takes 3.5 hours. Wrap up your sightseeing on the 23rd (Thu) to allow time to travel to Derby. Derby is a town in the Kimberley region of Western Australia. On the 24th (Fri), make a trip to Boab Prison Tree, then explore the striking landscape at Galvans Gorge, then explore the galleries of Mowanjum Art and Culture Centre, and finally explore the activities along Manning Gorge. To see ratings, photos, more things to do, and other tourist information, refer to the Derby road trip site . Traveling by car from Dampier Peninsula to Derby takes 5.5 hours. In May, plan for daily highs up to 39°C, and evening lows to 22°C. Finish your sightseeing early on the 24th (Fri) so you can travel to Windjana Gorge National Park. Kick off your visit on the 25th (Sat): explore the activities along Windjana Gorge National Park. For traveler tips, more things to do, where to stay, and other tourist information, you can read our Windjana Gorge National Park trip itinerary builder website . Traveling by car from Derby to Windjana Gorge National Park takes 5.5 hours. Finish your sightseeing early on the 25th (Sat) to allow enough time to travel to Fitzroy Crossing. Fitzroy Crossing is a small town in the Kimberley region of Western Australia, east of Broome and west of Halls Creek. Kick off your visit on the 26th (Sun): explore the fascinating underground world of Mimbi Caves. For where to stay, traveler tips, maps, and other tourist information, read our Fitzroy Crossing trip planner . Getting from Windjana Gorge National Park to Fitzroy Crossing by car takes about 5.5 hours. Wrap up your sightseeing on the 26th (Sun) to allow time to travel to Wyndham. Wyndham is the oldest and northernmost town in the Kimberley region of Western Australia, located on the Great Northern Highway, 2210km northeast of Perth. Start off your visit on the 27th (Mon): take in the dramatic natural features at The Grotto, look for all kinds of wild species at Marlgu Billabong, then make a trip to Five Rivers Lookout, and finally pause for some photo ops at Warriu Park Dreamtime Statues. To find traveler tips, reviews, photos, and other tourist information, go to the Wyndham trip app . Traveling by car from Fitzroy Crossing to Wyndham takes 7.5 hours. In May, daily temperatures in Wyndham can reach 39°C, while at night they dip to 20°C. Cap off your sightseeing on the 27th (Mon) early enough to travel to Kununurra. Eschew the tourist crowds and head to Waringarri Aboriginal Arts and Molly Springs. Spend the 28th (Tue) exploring nature at Mitchell River National Park. The adventure continues: take in the exciting artwork at Artlandish Aboriginal Art Gallery, take an in-depth tour of Durack Homestead Museum, make a trip to Warmun Art Centre, and look for gifts at The Sandalwood Factory. To find ratings, traveler tips, and other tourist information, use the Kununurra trip builder tool . You can drive from Wyndham to Kununurra in 1.5 hours. May in Kununurra sees daily highs of 39°C and lows of 20°C at night. Finish your sightseeing early on the 30th (Thu) so you can travel back home.